!!!! Johnny says BOOOOO !!!! I am SO excited to invite my dolly buddies to share in my fun and enjoy my new blog! I plan to post dolly pics at least once a week and would love everyone's comments! Make yourself at home........look around.........let me know what you like and HAVE FUN! I would like to share my love for 'paper dolls' on this first dolly day! My wonderful friend, Pat made these paper dolls for me and I treasure her friendship AND my sweet little dollies! Thank you girlfriend! We declared today a 'snow day' and went to the movies this afternoon! 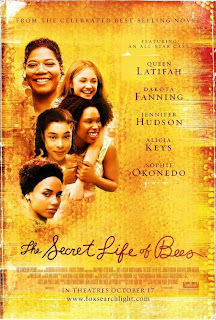 We saw 'The Secret Life of Bees' and it was wonderful! It is definitely best to have read the book first to develop the characters more fully. so we both knew the story well, from reading it AND discussing it! A MUST SEE........can't wait to buy it in DVD to watch it again.....and again! Perfect casting.....love each and every character! I made this recipe today and it was delicious......but I ADDED 2 ingredients and it came out perfect! A very moist, sweet and delicious cake! No one GUESSED the two missing ingredients and I just realized I better POST them QUICK! I added 2 EGGS! I don't remember ever making a cake without eggs and with all the ingredients AND 2 eggs......this was a wonderful flavorful cake! In large bowl, combine butter and sugar using electric mixer. Beat in buttermilk. Add flours, baking soda, baking powder, cinnamon, salt and apples and mix to combine. Spread evenly in lightly-greased Bundt pan. What do you think I added to make this cake perfect? I received the sweetest gift from my cousin, Cindy! A PATTERN! Just what I needed to keep going! And of course a little something that she made and one of her handmade cards! THANK YOU, Cindy! You always give the best gifts! My blog is now public and I have even started a list of blogs I think are altogether NEATO!!! It will be fun to blog with all my 'old' friends and make some new ones with shared interests! Thanks for the help, Lila! You've been my inspiration! Retro Cafe Art is hosting a really neat giveaway! Thought some of you might like this link! Check it out! I have enjoyed all of the creative websites I have found lately! I am learning something new every day! This is MY favorite new product! 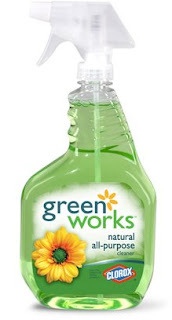 I am using 'green products' all through my house but this spray is good for everything! And it has a fresh smell, too! Use the link in the comments for other favs! I'll veer off the apron theme today and show another person's talent! SOCKS! and that look cute! I love them! For more of her beautiful creations, check out Jeannie's blog! A new day.......a new design! I'm seeing GREEN........another day........another apron! heehee! .......keeps the doldrums away! heehee! I've had so much fun making aprons this week! I got the pattern from the delightful blog, "One More Moore". I found this site when I was parusing "Free Patterns"! What a COOL site! I'm seeing ruffles......and how can you feel 'blue' wearing ruffles! Now what do I do? I would love some of your suggestions! So what are some of your ideas? I am anxious to get started! I washed it all and I will need to press it and then.........??? I went to a sale at Magpie's this weekend and picked up some treasures. They were having an anniversary sale and she had the store decorated for Fall. I wish I had taken pics of the cookies I brought home for hubby ( I just have the napkin for the photo!) There were black cat cookies and lots of cute designs! I love shopping the clearance area of my favorite stores! I got some cute things and didn't pay a whole lot either! And everything smells so good! I spent all my creative time today looking at creative blogs! I've found links on a friend's blog and then links on those sites and I've seen some amazing crafts! I am excited! But necessity is the mother of invention.......and I wanted a creative way to wrap some small gifts this week and came up with 'gift pouches'! slipped a little necklace in the bag and taped the top. And why make ONE......when you can make dozens! heehee! I studied 'dolls' in school! Do I have an excuse for collecting dolls now? heehee! 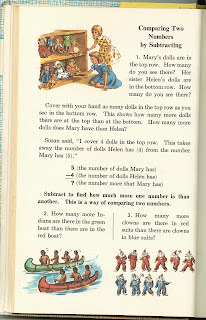 This book is "The New Discovering Numbers" Grade 3 copyright 1959! PERFECT! 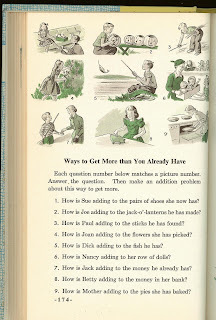 And one of the pages should help when I am 'convinced' I NEED a new doll!